Although I do not set out to find fault, I find there are things that jump out at me when they are wrong and this can be annoying all round, especially when easily avoidable. Unfortunately, when I have become absorbed in some drama, thriller or adventure story on film or TV, the presentation of a glaring error becomes a huge distraction to whatever is going on and spoils it. I recognize the efforts made to get things right in period drama, and I recognize that it might not bother other (perhaps most) people, even had they noticed the problem in the first place. Even so, I think the things I notice to be wrong are so easy to avoid that there is little excuse. I am sure that in most cases the production team would have wanted to get these things right if they had had the opportunity. When I refer to period drama (or whatever term is appropriate) I mean the twentieth century, or the period I and my parents knew. No doubt horrors are perpetrated in drama relating to earlier periods but I know rather less about the detail so am unable to comment. What I set out below is not a complete list of 'avoidable errors' but are those that came to mind when I decided to write them down. No doubt I will add to them. Perhaps others will contribute to the list too. If this assists some research assistant avoid an error then the job will be done. I appreciate that sometimes errors are known about and overlooked in favour of heightening the sense of drama. I have no truck with this, which feels like lazy script writing (please do not mention the word artistic licence!). 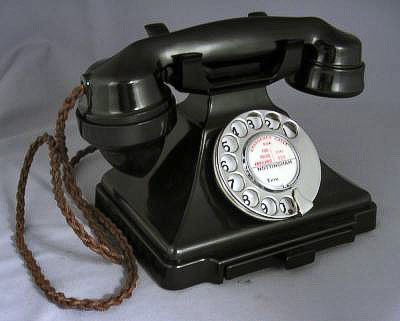 In period drama, telephones will usually be of a type that has a dial and a bell. These perfectly standard features seem often to defeat the most basic research activity and are so often got wrong that comment appears necessary. I may classify the errors as follows. Incoming calls are indicated by means of a bell and this arrangement is often wrongly portrayed. During the first half of the century the telephone instrument did not incorporate a bell and so a separate bellset was required. In most houses telephones were installed in the hall (often next to the front door), from which point the bell could be heard all over the house. The telephone would have been on a hall table or possibly a shelf, whilst the bellset would have been fixed to the wall nearby, normally fairly high up. We must remember that making calls was expensive and were correspondingly short so the hall was perfectly satisfactory. In offices (where in most cases there would have been far fewer phones than we would see now) bells might be on the wall or might be bolted to the underside of the associated telephone to form a kind of base unit, and the designs allowed for this. 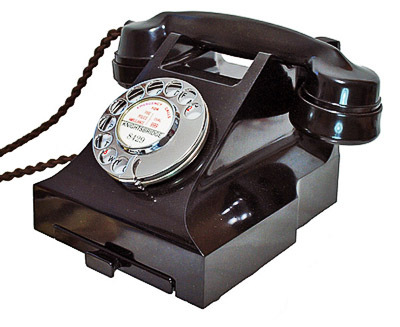 From the mid-1950s the telephone bell was usually included integral with the telephone, which had necessarily to be of a slightly larger design. In most homes the telephone would still be in the hall, but would not need the separate bellset. These are examples of typical equipment. On the left is a 200-type telephone typically found in homes and offices 1930s-1955; this type did NOT have an integral bell. In centre is a bellset, usually mounted high up on a wall in hall or office and used in conjunction with 200-type telephone. Occasionally the bellset is actually mounted underneath the phone to form a base. On the right is a 300 type telephone that incorporated an integral bell. This was found 1930s - mid 1960s, at first in offices then from late 1930s also in homes. Most of this equipment was black, but ivory was also supplied and (more rarely) red or green. It was certainly not unknown to have a telephone installed in a room (lounge, study or bedroom, for example), but because of the extra cost of rental this would usually have been in the better-off homes. In the period when telephones did not have bells the bellsets were still mounted in the halls from where they would have been audible throughout the house. Exceptionally a second bellset might have been installed, to be heard upstairs in a large house, for example. At that time the Post Office rented, installed and maintained all the wiring and equipment so you did as they said. It was really only from the early 1950s that telephones with integral bells became common in domestic premises and, as already noted, these did not require a separate bellset. It therefore follows where there were two (or, rarely, more) telephones of this type on the premises, they would ring simultaneously. (The models with bells were available from the mid 1930s but were at first intended for offices and whilst by no means unknown in domestic premises this early it would have been unusual until the early 1950s.). The new era plastic telephones that began to be installed from the early 1960s, and all equipment that followed, had integral bells (or some other kind of sounder, of the kind found in a trimfone, for example). There is more that might be said but I will just observe that in multi-occupancy houses (of which there were lots) it was not unusual for the hall telephone to be connected to a coinbox mechanism so that the user paid for the call at the time. This would have been of a similar type to that used in telephone boxes at the time. In the 1930s-early 1960s period it would have been a black button A and B box where the money had to be inserted before dialling, and after that the grey type where you put the money in when the call was answered. Anyone could answer an incoming call. From the film director's point of view there are two obvious sources of error. The first is to use the wrong sort of telephone prop at the wrong date. The second is where the earlier 200-type telephone is used in a room setting and the bell sounds as though it was in the same room. It would not have been, it would have been in the hall and would obviously sound distant. Since for many years phones with and without bells looked completely different this error is easily avoided. Telephones did not originally carry a 'dial' because subscribers would ask the operator to connect calls. From the mid 1920s the telephone system began converting to automatic operation and by the late 1930s the largest cities and towns had been converted, the process being substantially completed by the end of the 1950s. Automatic operation required a dial telephone so subscribers could indicate the number that was wanted. On old telephones (pre 1960s) the dial would have been one of two types. In most places these bore only numbers, set behind the finger plate, in black. 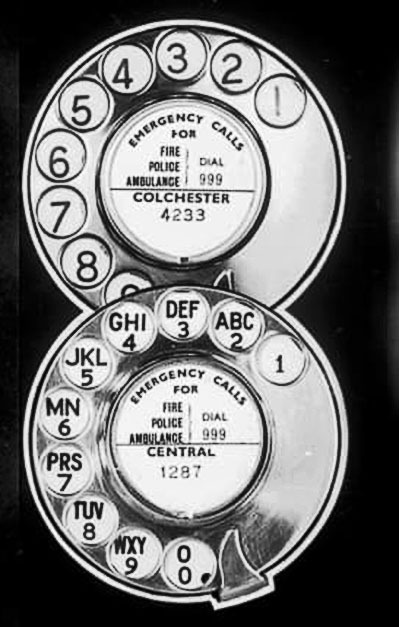 Only in Britain’s largest cities (London, Birmingham, Manchester, Liverpool, Glasgow, Edinburgh) did dials ALSO have letters (in red) behind the finger plate; these enabled the first three letters of exchange names to be dialled in addition to the number required. Later telephones all had dials with numbers and letters as subscriber trunk dialling became possible (allowing subscribers to dial any number). Note that it was only in recent times telephone users became 'customers'; before that they were 'subscribers'. Prior to the 1930s, it was not unusual in rural areas for telephones to have no dials and the operator was reached merely by lifting the receiver. A rapidly diminishing number of exchanges of this type survived into the 1950s. Of the various errors committed in films the most common is to see a lettered dial being used on a phone in some remote village. This is just wrong. Another error is to show the dial label (the information in the centre) showing the 999 emergency service information at a period when the 999 service did not exist (see later). Until the 1960s it was not possible to dial trunk (long-distance) calls directly, they had to be connected via an operator and at busy times you had to request the call and the operator would call back when the trunk call could be established. What constituted a trunk call varied depending on where one was, but it would be safe to assume anything over 40 miles would be one, and sometimes less. They were very expensive and made sparingly. Old films observe this but modern period pieces do not always get this right and even imagine that in the 1950s you could dial anywhere. You could not. By the way, if you were using somebody elses phone it was quite common to ask the operator to make the call ADC (advice of duration and charge). This meant after it was finished the operator would call back telling you the cost, so you could (for example) give the householder the cash. I have never seen it in films, but my family frequently used the service. The command by a police detective ‘trace that call’ was rare and usually didn’t work. Until the 1970s/80s the automatic exchange equipment was all electro-mechanical and it was impossible to trace a call once it had been released, as the equipment maintained no record. Calls could only be traced by GPO staff whilst in progress. An engineer had physically to go and inspect the exchange equipment starting at the exchange at the receiving end and tracing the connections back from the called line through successive equipment racks. Only if the caller initiated the call at the same exchange (very unlikely) would GPO staff be able to trace the initiating line quickly (ie within a minute or so). More likely the staff would identify the call coming in from another exchange and have to contact staff there to continue the trace, and so on. It could take many minutes and could involve up to three exchanges, perhaps more. Expecting caller to hang on while all this was going on was optimistic. Of course where calls were routed through manual exchanges records might have been kept or staff might recall it. In dramas representing anything before 1980s it is an error to imagine that calls can be traced after completion and even during a call a complete trace would be unusual. Nevertheless I have seen a completed call trace asked for in a period drama, but shouting at the screen did not diminish the fatuousity of the request. In olden days ONLY the caller could ‘ring off’ and the line would be held open until the caller replaced handset. The recipient might put handset back but the line would remain connected and prevent that phone being used to make a fresh call. So in your period thriller when the caller rings someone up and is murdered after half speaking the name of the murderer (and leaving the handset dangling on its wire), the recipient’s line is locked and he cannot ring off and call the police! Basic stuff. In most old dramas where it is necessary to invoke the support of a telephone kiosk, the wrong sort is used. From the mid 1930s virtually all kiosks throughout the country were of the standard kiosk No 6 design (the red ones with large rectangular glass panes and small panes either side. These had the King's crown on the faces of the roof (invariably painted red - this gold thing is a new fad that seems to have been done about 2012). New boxes had Queens Crown from mid 1950s. Note that the doors had very strong self-closing mechanisms so you did not find them with doors open unless someone was actually jamming them open (despite some dramas showing boxes with open doors). This type of box is represented by the one on the right in the photo below. However so many dramas show the kiosk No 2, an earlier and much larger design where there are rows of three nearly square glass panels along each face. These were made in relatively small numbers and from 1925 most of them were used in London with odd ones in certain other large cities. They never appeared in country areas or small towns, where only K6 designs are found. This older type, the K2, is represented by the box on the left, below. It ought not be so hard to get this right. Other annoyances include dramas where some victim is dumped in some country road and finds a phone box, used to ring someone up and say they have been kidnapped (or whatever) but do not know where they are. Every phone box has a label inside giving its exact location and its number (near the vanity mittor they were fitted with). Use of the 999 system can be problematic in dramas. It only came into use in the London area in 1937 and Glasgow in 1938 and was not widely available until 1948. It could only be used in areas with automatic telephone exchanges so in rural areas callers had to go via the operator. Before 999 was available everyone had to go via the operator although certain telephone boxes had an emergency button wihich obtained an operator on priority basis. 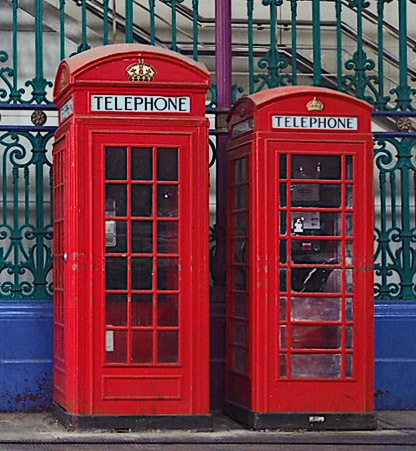 Emergency calls could be made via Police telephone boxes and in earlier days street fire alarms were available which, when operated, sent a coded signal to a fire station indicating which alarm had been operated so the crews knew where to go. Using 999 at the wrong date or in wrong place is not unusual in films. Where phone books were not available for the area required recourse was had to directory enquiries and it is quite my experience that this service was used quite often. It was an entirely free services as the enlightened management in those days considered that letting you have the number would allow you to use the service and generate traffic and revenue. It is only since privatization that we have had to pay for it on the basis that you could not provide competition for such a service if British Telecom were offering it free. The outcome in my case is I will not now use it on principle and find some other way of communicating, or not bother. The point of mentioning here is that I rarely see the service used in films but my own experience is that this free service was widely used. I make no comment about portrayal of modern police officiers but I must shout out about those portrayed in period dramas. You do not have short policemen. Until the 1980s all police forces had minimum height standards for men (with proportionate body weight) and this was for practical reasons where officers had to deal with incidents on their own, without radio backup. No ordinary police force accepted candidates under 5ft 8ins and many looked for officers at least 5ft 10in. I note that in 1961 two forces required officers to be at least 6ft. The height requirement was dropped by most forces during 1990 but they were still fully in force at recruitment stage in 1988 (the restrictions then included minimum heights for women officers, but these were set four inches shorter than that for men). It therefore follows that until at least the mid-1990s the majority of police officers of any experience would have been tall. Now these police officers did not shrink appreciably during their police service, reckoned as 30 years, so even allowing for some shorter officers being recruited towards the very end of the century the vast majority of serving police officers in year 2000 would have been of the traditional minimum height, and before 1990 they would all have been. In any drama or other film or TV work before 1990 it is simply not credible to show short police officers, ie officers below the minimum height for the force in question. A 5ft 3ins officer in 1960? Emphatically no! It was a huge feature of the police service that officers were usually quite well built and tended to look rather like police officers even in plain clothes. This could be both useful or a problem, depending on circumstances, and dramas actually made in the 1940-60 period rather played on this. I don't care how good the actor is, if he is short it is just unrealistic to cast him as a police officer. I am not sexist referring to 'him' as until the 1970s women police were in a separate branch with separate duties and were not placed on an equal footing with male officers. This changed in 1973 in the Metropolitan Police but all forces soon fell in line. Another annoyance, relating mainly to pre-war dramas, is seeing chief constables getting heavily involved in cases. Do bear in mind most chief constables were ex army or something similar and had no police training at all. Even in the Met, the most senior officers (DAC and above) were civil servants (technically acting as magistrates) and were also typically ex forces and had no police training. They did not even have warrant cards (they had silver passes instead). It was not 'normal' to employ chief officers from within the police service until the 1960s. Police, in dramas, with long hair is an annoyance. The traditional police service was always fairly humourless about uniformed (male) police officers having long hair. Even in the 1960s/70s when wearing hair long was fashionable I do not recall uniformed police being allowed to wear it (though it might have been a tad longer than military standard). Showing 1960s period films with uniformed policemen with hair significantly longer than traditional didn't happen, despite what is seen in 1970s cult thriller TV where sometime hair exploded from back of helmet. Emphatically no! Use of the two tone horn or siren is very irritating. We see drama scenes of police cars turning up to crimes still in course of execution, at night, with sirens screaming. NO. You do not advertise you are turning up to a crime scene in a manner where criminals can hear you coming a mile away and run off. Moreover why are lights and sirens being used for non emergencies, like taking an arrested person to a police station when there is no compelling need for speed? Get an adviser. This is an area where there is so much wrong that I can hardly even begin to criticize. Suffice to say that scientific investigation of crime was rather limited until the late 1950s when police and home office laboratories became available and scenes of crime officers (generally specially trained detectives) were employed to collect forensic evidence and get it to a laboratory. The problem in dramas is that the four basic skills (photography, fingerprinting, evidence collection and pathology) are all muddled up. In larger forces these were separate specialist areas whilst in smaller ones there was some combination. However if you imagine your pathologist (who would by no means always attend a murder personally) is the chap you want to give you an opinion about handwriting similarity, or a paint match, or a rare kind of soil found only on the west face of a particular Pategonian mountain, it is a delusion from which you need urgently to be disabused! Moreover this 'I'll just pop into the lab and see how they are getting on' stuff needs to be placed in the realms of fantasy too. In most of the UK the laboratories could be between 50 and 100 miles from many police stations and dealt with cases on a kind of production line process (there were only eight laboratories covering the whole country in 1961). Not only was it impractical to 'drop in' but even had you done so you might not have been made all that welcome and there was no guarantee that the scientific officer dealing with the case was even there. Moreover the laboratories were required to function as centres of independent 'expert witnesses' and there were protocols to be observed lest it might be thought the independence of the scientist was being influenced. I know, I worked at one. And why is it that the senior officer (never ever first at the scene, which itself odd) always manages to turn up as the photographer (sometimes more than one!) is cluttering up the scene taking meaningless photos of nothing in particular as some kind of pantomime act? We can all see it is a crime scene without this going on. Could we not be just a bit more imaginative? I won't dwell on the arrival at the crime scene to see the set entirely occupied by uniformed police standing round doing odd things in strange locations and obviously there to give atmosphere. Six or more officers? In the country? No obvious reason for them being there? No van to bring them there? Really? My next grumble about portrayal of police is that many in film production teams seem unable to grasp that there are lots of police forces and that they do different things in different ways and wear different uniforms. In the twentieth century you could actually see the uniforms (not then hidden by body armour and dayglo jackets) so differences between forces were more obvious. Before 1974 there were more forces doing things more differently, and before 1964 there were even more forces doing things even more differently (there were until that year 164 county and borough forces in England, Wales and Scotland).. Most cities had their own force and areas outside the cities had county forces. This just needs taking into account when showing police officers moving about. Local insignia were important symbols in those days and many police foces used their own. I am afraid I have seen various dramas which have used police vehicles used for movement of prisoners bearing just a crown: these were only used by Metropolitan Police, provincial forces would have had their own vehicles. Prisoners might be taken a long way in a police or prison van but actually, until the 1960s when motorways were opening and railways were closing many prisoners were moved about on ordinary railway trains accompanied by police or prison officers who could arrange for compartments to be used. Constables very rarely wore peaked caps (usually only for motor vehicle work) and except in Scotland they did NOT have diced cap bands until 1972. The City of London has a different police force that wears red and white diced bands and very different helmets. On a number of occasions I see offences clearly committed in the City apparently being dealt with by Scotland Yard - this would have been rather unusual. Forces rarely tresspassed on the area of another except for routine enquiries and would have let the home force know if anything more interesting was planned. The Metropolitan Police did not even have police powers outside the Home Counties till 1964. What, in Foyles War, we are doing witnessing the 'Chief Commissioner' in London wealding some kind of authority over Hastings Borough Police I do not know; the Watch Committee should have told him (politely) to get lost. And what is this 'Chief' Commissioner all about? The title is Commissioner of Police of the Metropolis. It appears ignorance has created in more than one drama a police commissioner in various other parts of the country. Only The Met and City forces have one, everywhere else it is Chief Constable. This is all fairly easy to look up. It appears purveyors of drama do not all know the railways have their own police (as then did docks and canals military establishments and so on). Though once outside forces would be called in to deal with serious offences this assistance diminished as these special forces became larger and better equipped and it cannot be assumed the general police would just walk in and deal with a crime on railways, or wherever. Period dramas or thrillers involving military personnel are unavoidably going to come up against the matter of rank. Now if there is one thing that is a particular obsession in the services it is the matter of rank. The uniforms are designed to display the rank of all staff in a clear and unambiguous way and the correct display of the correct rank insignia will be unfailingly correct whatever else might be falling apart The same type of attention to detail also follows with other services using badges of rank, ranging from merchant navy, police, fire brigade and so on. Knowing this, and knowing how easy it is to check up, or ask someone, where there is doubt, it is curious how film makers get it wrong. This ranges from someone referred to by one rank but clearly wearing the markings of another, to bizarre markings that are just careless. Take the image below. In this instance the actor is dressed as a naval commander. As we look at him we see the left epaulette correct (loop at top) but the one on the right is upside down. There were about ten different shots of this chap so it was probably done over several hours of filming during which, apparently, nobody noticed or cared that it looked a bit odd. You would have thought the actor would have the gumption to have queried it. I spotted it instantly and after shouting at the television watched it with mounting exasperation that spoilt the programme. (From an episode of 'New Tricks'). Nobody in the navy could ever have done this, and even if they had committed the ultimate crime it would have been pointed out within minutes. Didn't anyone think this looked strange? The recent transmission of 'Death on the Tyne' fares no better. Various shots of the newly made up captain show him sometimes wearing four bars each side (correct), or three bars each side, or sometimes three one side and four the other. The scenes were clearly not filmed in order transmitted and someone was doing a not very good job of correcting this most basic of errors, but the result is chaotic and we were taking bets about what his appearance would show in the next shot, a complete distraction. In real life rank markings are never wrong, nor should they be in dramas. Period dramas nearly always get these things wrong. You get pillar boxes in cities and large towns because they have very large capacity. Until the present century (though perhaps during 1990s), outside towns and cities, letter boxes usually took the form of small rectangular boxes set into walls or exceptionally affixed to lamp posts or some other column. Occasionally a box would be inserted into a square stand-alone brick pillar. You very rarely saw a pillar box in a rural area or small town. Moreover you did not see pillar boxes outside any post office, even in towns. Post Offices nearly always had a high capacity letter box built into the outside wall and generally emptied from within the building. The situation changed during the 1990s when post office and royal mail operations became increasingly separated and post office franchises began changing frequently; installing a pillar box outside a post office then became the norm, but this is a fairly recent development. The above three images illustrate the type of letter box likely to be found in towns and villages and still common there. 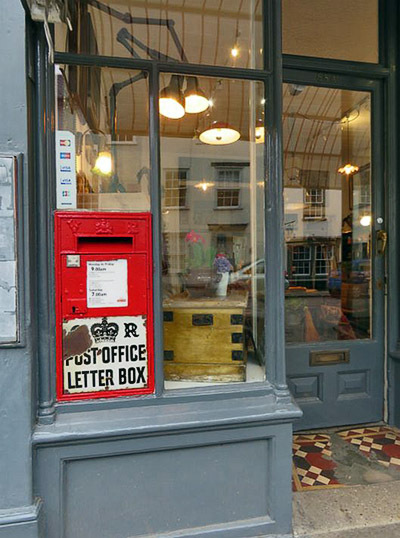 On the left is a large box inserted into a post office window. At centre is a wall box (probably the most common type). On the right is a wall box installed into a position where there was no wall, so a brick pillar was built rather than installing an unnecessarily large pillar box. A smaller type of box (not illustrated) was also available and attached to lamposts or telegraph poles. I cannot say that prior to the 1990s there were NO pillar boxes outside cities and larger towns, I have no doubt there probably were. I do say that in villages and smaller towns prior to around 1990 it was extremely unusual to find a pillar box and therefore very wrong to use one in a drama representing anywhere typical. As soon as I see a period drama of a country village with a pillar box in it the hackles go up,. It is not how things were and is so obviously wrong it detracts from the drama. Among the things that court scenes devise to bring on high blood pressure is the sight of a judge wealding a gavel. Such toys are the plaything of auctioneers (where the fall of the hammer has legal significance) but have never been used in English or Scottish courts where a quick movement of the judge's eyebrows is normally all that is necessary to maintain order. Nor are they used by magistrates, coroners or anyone else dispensing justice. Foreign courts may or may not use them and I assume research assistants have been contaminated by USA practice. I understand a gavel may be found at the Inner London Sessions court where for some traditional reason it is used by the clerk to warn of the imminant arrival of the judge, so that the court can stand. This is hardly typical and the judge doesn't touch it. Other things that annoy are (1) prosecuting and defending councel wandering around the court room - they don't, in Britain, and (2) jury foreman using their own form of words to announce the verdict - they don't, they are asked very specific questions by the clerk (not the judge) and the only words used in the vast majority of cases are yes, it is, no, guilty or not guilty. I do not really have much to say about cars and can see that more usually than not some trouble has been gone to in order to have plausible looking vehicles. I notice that they rarely seem to get any petrol which is a bit of a mystery as fuel consumption was heavy, but there we are. If they did fill up I would be having words about the garage - or shop - I expect. However, though I realize there are only so many very old cars available for film work, more attention is needed to get the number plates right. Three letter plates did not arrive until 1935 and reversed plates (letters following numbers) from 1953. Marks were issued locally for counties and county boroughs and while it was perfectly possible for a car to be registered in one place and used in another this was less so for official vehicles, such as police, which would almost always be registered locally and usually by the council to which the force was attached. I appreciate some latitude is required here but, really, when you have an obviously Scottish registered police car being used in Brighton it grates a bit. It would not have happened. Any two letter mark (or the last two letters of a three letter mark) with an S in it will be a Scottish registration. Cars present a splendid opportunity to employ a seriously flawed plot. The obvious cliche is the tampering with the brakes, so that on some notorious hill the brakes fail and the hapless occupents, showing no intelligence whatever, wrestle with the steering wheel as the car careers ever onwards. In none of these contrived dramas does it occur to anyone to change down through the gears, or even turn off the engine, thus at least reducing velocity to a speed with which the terrible plot can keep pace. However, I am not concerned with this. What wrankles are actors wearing glasses who do not need to, except for the role they play. If you look at any normal pair of glasses, the frontof the lens is curved. If however you look at an actor wearing fake glasses it will not be long before you notice that the glass is flat. This is particularly noticeable in studio surroundings where there can be awkward reflections all over the place and it will not be long before the flat-glassed fake becomes terribly obvious. I suppose someone thinks they've done a good job providing actor's glasses for some part or other, but they stand out like a sore thumb and it is unnecessary. A slightly curved glass of uniform thickness would behave just like plain glass without that tell-tale 'I am a fake' connotation. Little to say here, except... Why in some wretched plot or other, in whatever the drinking establishment might be, do people not finish their drinks before leaving? I talk not of fights or imminent imminent arrival of the forces of law and order, or their crimianl counterparts, I talk just of a group of people going away. Too often half of them just leave their unfinished drinks. OK, it can happen, but my experience is that people pace themselves to finish together, and eventually down what is actually quite an expensive purchase. Not in films it seems. Ranckles, it is unrealistic. And why do people entering rooms never close the door behind them? There are so many railway horrors committed in dramas that for the moment I will focus on just one, and that is the term 'train station'. How those words are used now is immaterial beyond saying that the term was practically unknown in this country in the nineteenth and twentieth centuries and should never, ever be used in period drama. Normal people in everyday speech simply referred to the word station, and added the station name if there were a choice. It is as simple as that. In the event that ambiguity were possible, then the term was 'railway station' (a station on the railway). There were of course lots of other kinds of 'stations', such as police stations, fire stations, RAF stations. Personnel based at these establishments usually had their own jargon for these places but used the word 'station' in public, the context usually making it perfectly plain where was meant. A policeman might 'invite' you to the 'station' and there was no doubt about where was meant; if he'd wanted to take you on a train journey he would have said railway station. It must be remembered that (railway) stations often did more than trains. For example you could deliver or collect luggage and parcels or consign goods or use the left luggage office, none of which involved a train. There was one station somewhere in the west country where the railway station only served boats. So in any period drama the word is station or railway station, but never train station. I left bus stations off my list (bus stations were never all that common, and are much less so now). It is my experience these were invariably called bus stations by all concerned. I dare say the term was shortened, but I never heard it myself. I realize in period drama it is progressively harder, the further back in time is portrayed, to avoid the use of the railway and that finding facilities to film railways is challenging, but even so... If we are filming what is obviously a long-distance main line railway journey to have a shot of a branch line tank engine wheezing its way along a single track line at 15mph actually detracts from the narrative and distracts attention from what is going on, for it clearly isn't a main line journey. The fact that it was occasionally possible for engines to be changed on a journey does not make it mandatory to do so in drama. It is annoying to see a train hauled out of a terminal with one engine and in the next shot it's a different one and on arrival it is yet another, or maybe the first is back. Sometimes the carriages have mysteriously altered form as well. With so much effort gone into getting other details correct can we not fix this too? Mind you, this is not a new problem. Nothing can inflame the seasoned pedant more than 1960s/70s cult television. It was perfectly possible in The Saint to see three or four shots of a railway journey with obviously very different trains in each one (sometimes one but only one will show it as overhead electric), with colours, locos, number of carriages altering each time. Not one shot was filmed for the programme, they were all stock images and used whenever a train was required. Great fun in a low budget programme that had become a parody of itself but no good in a serious drama.